Without reaching Level I we cannot reach Level II, from 10% Yin and 90% Yang we improve and become 20% Yin and 80% Yang. This is a natural process, in the beginning we are stiff, tense and make mistakes. We need to learn how to relax, to be calmer, to let go and take our time when doing things. This is the same as everything in life. We might want to do something, but we never think about the consequences and the response from the other side. We just do what we want but in the end we may end up upset and disappointed because we do not get it. This is nature. We cannot have what we want until the situation is right. Sometimes we get what we want right the way, but in the long run we might find we need to pay more back. 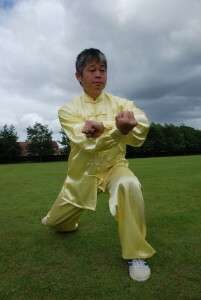 When studying Taijiquan 太極拳 we can easily see the movements when our Sīfú 師父 performs them, so we copy and follow and soon we think we are getting it and doing it correctly, but actually we still have a very long way to go. It might look the same but the energy, the internal aspects and the attitude are not the same. Although we practice a lot it is difficult to improve another 10% so we can reach 30% Yin and 70% Yang. This is hard to do.